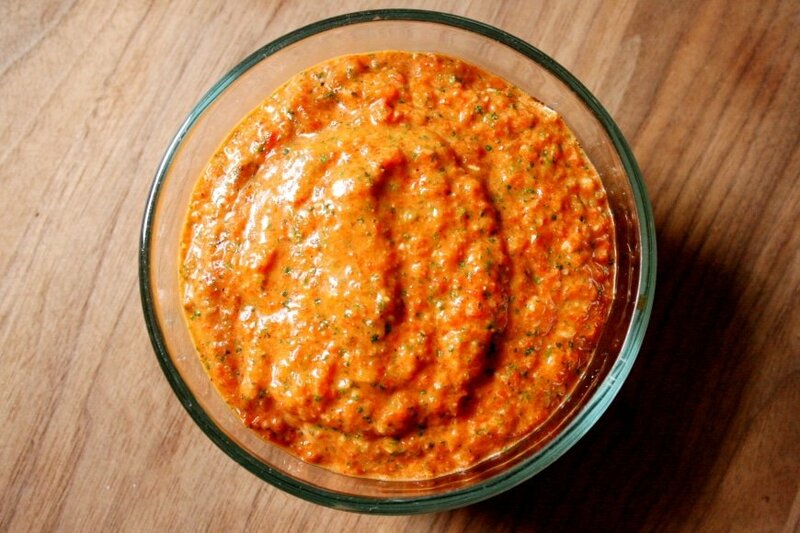 Roasted Red Pepper Pesto | From Scratch Fast - Recipes & meals from scratch for busy cooks! Four months is an awfully long time to wait for a single bell pepper. We’ve never had much luck growing peppers in our garden, and this year our seedlings flowered into a single, lone capsicum. We waited and waited until the pepper turned yellow before finally slicing it up last week for a salad. Sure it was tasty, but was it worth the wait? Eh, probably not. Thankfully, however, our farmer’s market is brimming bell peppers this time of year. I usually forgo green for sweeter red, orange or yellow varieties (which are actually just riper versions of the green guys), and every week I buy a couple to toss into tacos or stir fries, or to roast for salads or pesto. This pesto is a late-summer favorite. Sweet red peppers get blackened right on our gas burner (which, for me, smells like the first hint of fall), then peeled, chopped and blended with garlic, Parmesan, pine nuts, red pepper flakes, basil (and mint, if I have it), lemon juice and olive oil for a sweet, smoky and slightly spicy sauce. I dollop the pesto over grilled fish, chicken or steak, slather it on grilled cheese sandwiches, drizzle it over soups and toss it with pasta. 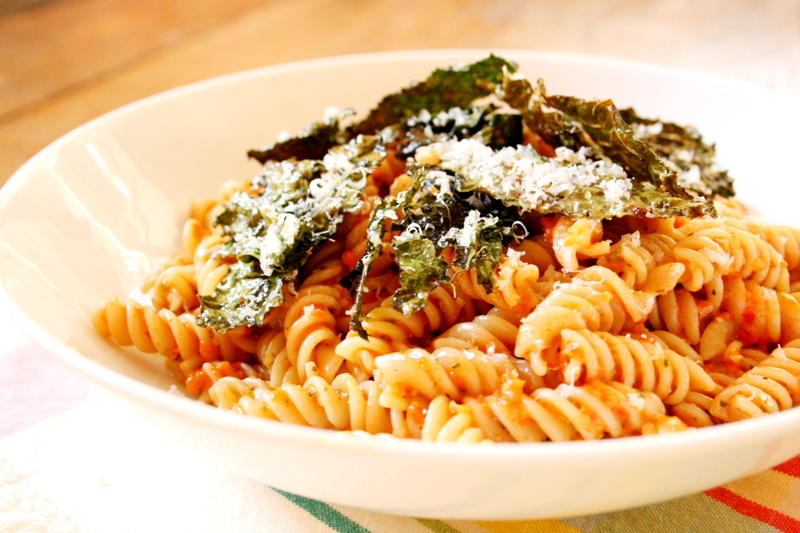 This past Tuesday I tossed the pesto with a pound of pasta, a spritz of lemon juice and some olive oil, then topped each bowl with crispy Parmesan Roasted Kale* (see kale recipe below). The crispy, salty kale was a delicious contrast to the sweet smokiness of the pesto. Ella starts a preschool next week (a new school! 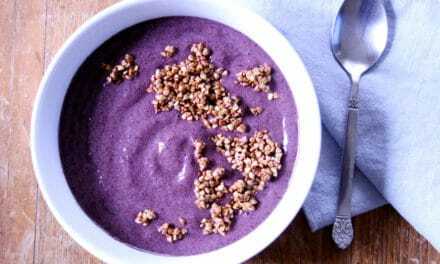 ), and this is just the kind of dish that I like to make during the school week, since it can double as a nutritious, ready-made lunch the next day (sans the kale). 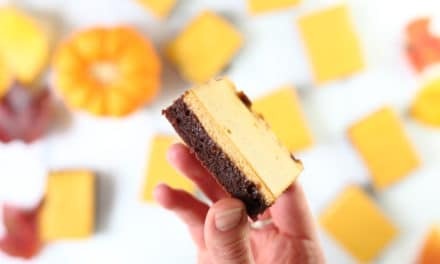 On that note, below are a few more back-to-school meal ideas for easy weeknights—and even easier lunchboxes. Happy September! 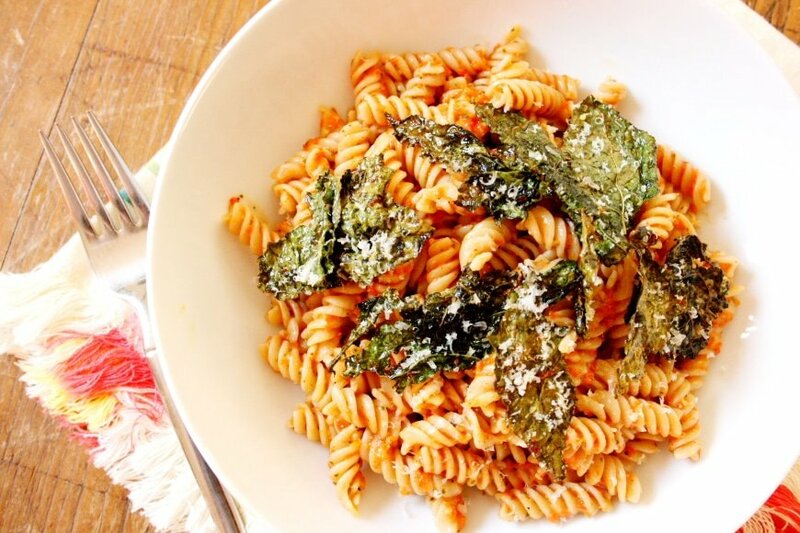 *For crispy Parmesan kale, remove the stems of dinosaur kale (also known as Lacinato kale) and tear the leaves into bite-sized pieces (make sure the leaves are thoroughly dry). Place the leaves in a bowl and toss them well with olive oil, salt, pepper, grated Parmesan cheese and lemon zest. 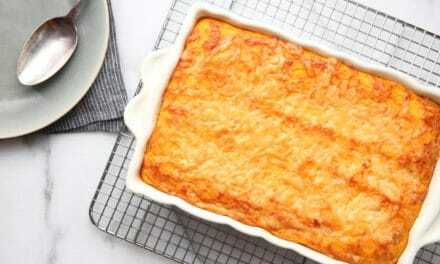 Spread the leaves on a parchment-lined baking sheet in a single layer and bake in a 375-degree oven for 12-16 minutes, stirring halfway through, or until crispy. The sweet, smoky and slightly spicy pesto is delicious on top of fish, chicken or sliced steak, as well as smeared on grilled cheese sandwiches and tossed with pasta. 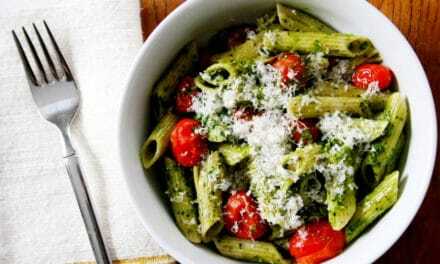 For a vegan version of the pesto, omit the Parmesan cheese and add another tablespoon of pine nuts. Preheat the broiler with a rack 4-5 inches from the heating element. Line a small sheet pan with foil. Cut the bell peppers in half through the stem end and place the peppers cut side down on the pan. Broil until blackened all over. 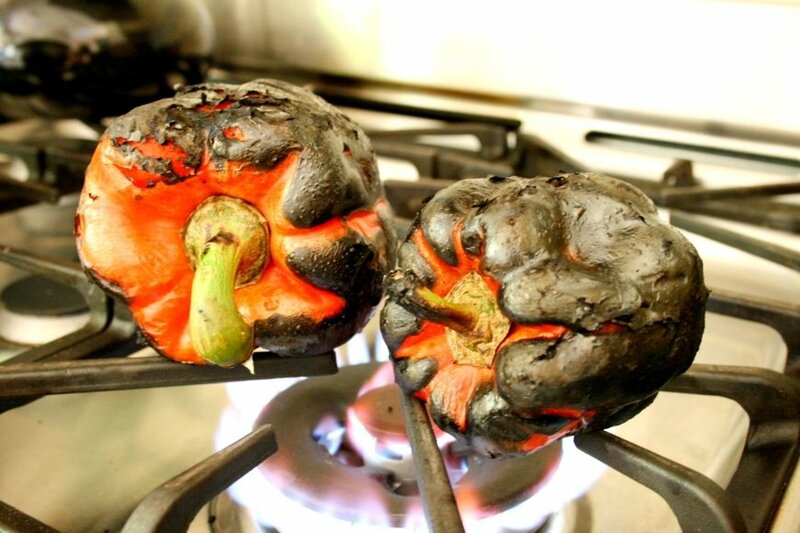 Alternatively, the peppers can be blackened directly on the flame of a gas stove; turn them often for even cooking (just let them burn; they should be evenly blackened). Transfer the peppers to a bowl and cover with plastic wrap to steam for 5-10 minutes. Peel off and discard the skin. Rinse the peppers briefly to remove most of the blackened bits. Discard the stems and seeds and coarsely chop the peppers. In a food processor with the blade running, add the garlic cloves and coarsely chop. Add the roasted red peppers, pine nuts, basil (or basil and mint), Parmesan cheese, red pepper flakes (if using), lemon juice and a generous pinch of salt and pepper. Process until mostly smooth. With the blade running, drizzle in 1-2 tablespoons of extra virgin olive oil, until you reach the consistency you want (I usually use 2 tablespoons). Taste and season with additional salt, pepper and/or lemon juice as needed. Do Ahead: The pesto can be covered and refrigerated for up to 3 days. Delicious! Made this tonight for Angela and Pablo. They loved it! Thanks Nicki!